President Donald Trump signed three executive orders Friday that aim to reduce the time it takes to fire poor-performing federal employees and overhaul federal employees union rights, including cuts to official time. In a conference call with reporters on Friday, senior White House officials said the executive orders call back to a promise Trump made at his State of the Union address, in which he sought to empower every cabinet secretary with the authority to award good federal employees and to remove poor performers more quickly. One of the executives orders aims to make it easier for agencies to fire poor-performing employees and makes it harder for those employees to hide adverse employment information when seeking re-employment at another agency. The executive order would shorten the timeframe for Performance Improvement Plans (PIPs), a last-chance opportunity for federal employees flagged for removal or demotion to turn around their performance record. Depending on the agency, a PIP timeframe can run between 60 and 120 days, but the EO would condense that window to 30 days governmentwide. The Government Accountability Office has found it takes between six months and a year, on average, to remove federal employees flagged for misconduct, plus an average of eight more months to resolve appeals. “Every year, the Federal Employee Viewpoint Survey has consistently shown that less than one-third of federal employees believe the poor performers are adequately addressed by their agency,” Bremberg said. Under this EO, agencies will be required to report disciplinary actions records and management of poor performers to the Office of Personnel Management. Data from the Office of Personnel Management shows that federal employees are 44 times less likely to be fired than a private-sector worker. The Trump administration first sought to make it easier to fire federal employees under the VA Accountability and Whistleblower Protection Act. Under that authority, the Veterans Affairs Department, under the first full year of the Trump administration, fired 2,537 people — about 500 more federal employees than the agency let go in 2016. 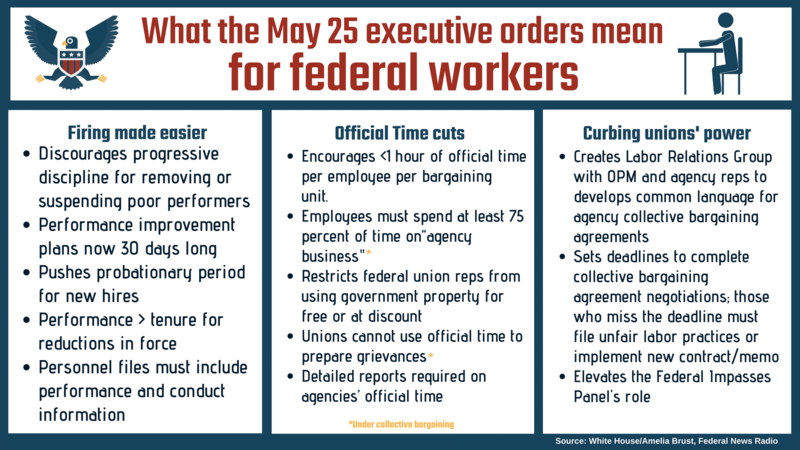 A second executive order would significantly reduce the amount of time that federal employees can be paid for union work while on-the-clock. 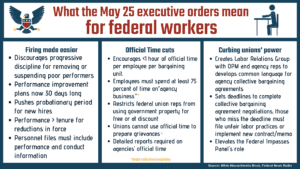 Under the executive order, federal employees would not be able to spend any more than 25 percent of their work hours on through official time. The executive order calls on agencies to renegotiate contracts with labor unions and reduce official time by about two-thirds. White House officials estimated the cuts to official time would save more than $100 million a year. 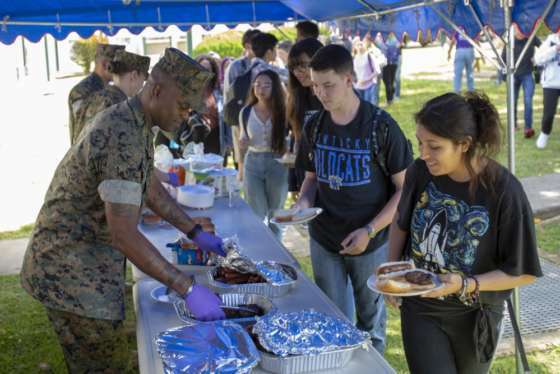 Jeff Neal, a senior vice president for ICF International and a former chief human capital officer at the Department of Homeland Security, said any upcoming changes to official time won’t happen overnight. “Official time is negotiable under the labor relations statute, so getting these changes in place will take time,” Neal said in an email to Federal News Radio, adding that agencies cannot unilaterally reopen contract negotiations with unions unless a contract expires or specifically allows it. In March, the Education Department ended labor negotiations with the American Federation of Government Employees and instead implemented its own unilateral set of terms. The White House claims more than 470 Veterans Affairs Department employees, including 47 full-time nurses, spend 100 percent of their work-hours on union-related business. A third executive order would curtail the labor contract bargaining window between government and unions. The terms of renegotiated contracts would be overseen by a new Labor Relations Working Group, which the EO orders OPM to establish. In addition, the executive order would require federal union contracts be posted to an online database, with the goal of promoting transparency. Senior White House officials said a drawn-out bargaining benefits union negotiations. Federal agencies, they said, paid $16 million in salaries for union negotiators in 2016. Elevating federal workforce? Or an ‘assault’ on feds? OPM Director Jeff Pon said the executive orders will protect federal employees who are doing their jobs, while making it more efficient to remove those who are not. “By holding poor performers accountable, reforming the use of taxpayer-funded union time, and focusing negotiations on issues that matter, we are advancing our efforts to elevate the federal workforce. The vast majority of our employees are dedicated public servants who are dedicated to their missions and service to the American people. It is essential that we honor their commitment, and these measures reflect just that,” Pon said in a statement. J. David Cox, the president of the American Federation of Government Employees, said the president’s trio of executive orders would chip away at federal employees rights. “This is President Trump taking retribution on an apolitical civil service workforce,” Cox said. “Rather than promote efficiency in the federal sector, the administration is demanding federal workers lose their ability to challenge unfair, arbitrary and discriminatory firings and other actions. This would begin the process of dismantling the merit system that governs our civil service,” Reardon said in a statement. “Regardless of the extremely weak arguments he gives to end a century of progress for the nation’s professional civil service, it is obvious his aim is to create a culture of fear within the federal government in order to advance a political agenda in the executive branch,” Erwin said. Senate Homeland Security and Governmental Affairs Committee Chairman Ron Johnson (R-Wis.), signaled his support for the executive orders. “These reforms will improve accountability and productivity in the federal workforce, and I applaud the Trump administration for taking action to restore the public interest as the top priority of government operations,” Johnson said. 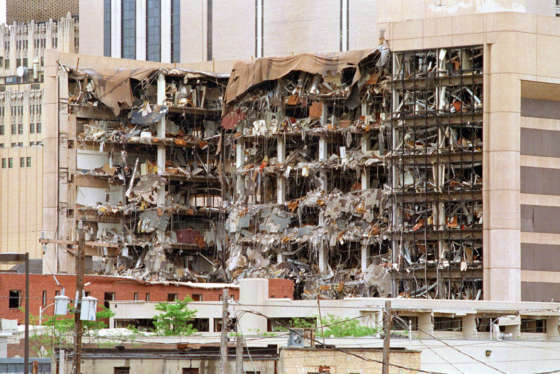 Sen. James Lankford (R-Okla.), the chairman of the Regulatory Affairs and Federal Management Subcommittee, said the EOs would reign in employee unions’ influence over government operations. “These executive orders strive to make the federal government more efficient, not only for the taxpayer, but for our great federal workers. We have thousands of federal employees who work very hard for the nation; it’s important that their work is not frustrated by the poor performance of a small few,” Lankford said.